Stroll Through Flemington Historic House Tour - October 25, 2014 ~ The History Girl! 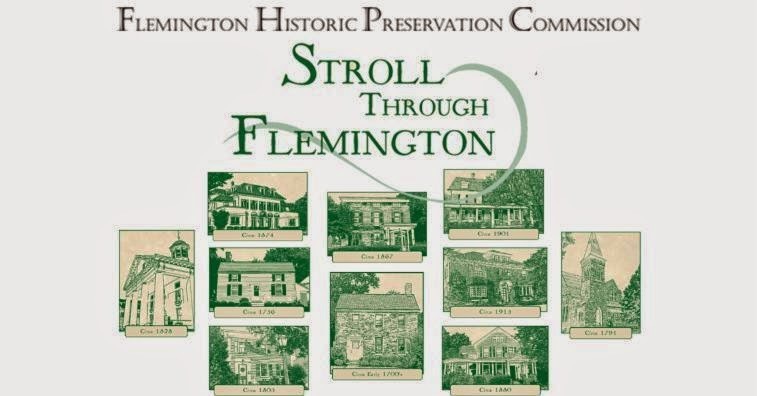 The Borough of Flemington and its Historic Preservation Commission is proud to announce 'Stroll Through Flemington', An Historic House Tour slated for Saturday, October 25, 2014 from 11:00 am - 5:00 pm, rain or shine. Meander the streets of our Historic District and visit six privately-owned historic homes and four iconic public buildings in self-guided fashion. Allow your imagination to picture the historic events that have shaped our Borough and embrace the charm and unique character of the District, and the warmth of our town. PayPal purchases may be made via: www.historicflemingtonnj.com. Tickets can be purchased on the day of the tour at the Hunterdon County Courthouse for $25.00 via cash, check or charge. We are grateful to our House Sponsors, Business Supporters, Friends and Volunteers and are confident that this tour will become one of Flemington and Hunterdon County's most significant and well attended annual events. Our House Sponsors...Teaberry's Tea Room, Flemington Car & Truck Country, Hunterdon Medical Center Foundation, Flemington Furs, Flemington B.I.D., ShopRite of Hunterdon County, Flemington Borough Council, Hunterdon County Tricentennial Committee, and Paula Anastasio of Weichert Realty. Our Business Supporters...Roman Jewelers, Matt's Red Rooster Grill, Stanton Holly Trail, Sweet Valley Farms, Coccos Cafe, Barkley's Gourmet, Main Street Manor Bed & Breakfast Inn, Gilded Lily Florist,Chive & Thyme Cafe & Catering, and Cinderellies Sweets. All tour proceeds will continue to aid Flemington's Historic Preservation Commission in their efforts to maintain Flemington Borough's historic integrity. We hope to see you along the 'Stroll'!